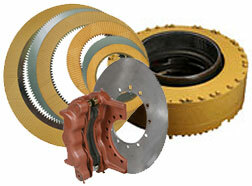 For over 80 years, industrial brakes and clutches have been our specialty. We stock, repair and exchange all major industrial brake and clutch systems for almost all type and make of machinery. Shown are some examples of industrial brake and clutch systems, but for a full catalog of what we stock, or any specific part numbers, please contact us.